ABSOLUTELY STUNNING 180 degree main channel, lake and Toqua golf course views, accent this tastefully done Traditional lake home. 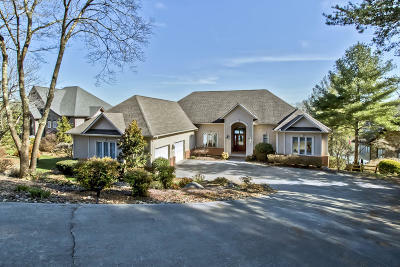 Built by Lee Hart, one of Tellico Village's premier builders. All natural cherry cabinetry highlight the grand, open kitchen with large island, breakfast area and open keeping room.The keeping room opens to a screened in porch and open deck where you can enjoy your private paradise. Large master suite and second bedroom or office with full bath on the main level. Two additional bedrooms and bathrooms with large family room and mini kitchenette lead to walk out patio on the lower level.